HUB, a London based developer specialising in mid-market homes, has released full details of the scheme to regenerate the former council owned site at Taberner House with the creation of 500 homes. 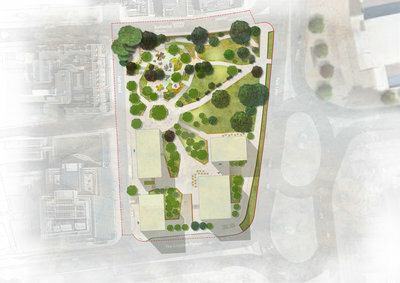 The scheme also includes designs by Grant Associates to revitalise The Queen’s Gardens, a popular public park. Grant Associates’ landscape strategy aims to reconfigure the park with the introduction of a central children’s play area and two new squares that would improve access to the gardens both for new residents and the wider community. A new café is also planned for the park. Elements of the garden’s original features, which date back to 1896 and include walls and a sunken garden, will be retained to celebrate the park’s Victorian heritage. The residential component of the scheme, designed by Stirling Prize-winning AHMM, will be arranged across four apartment blocks varying in height from 35 to 13 storeys. The scheme, which is a joint venture between Hub and Bridges Ventures, will further include 13,000 sq ft of retail and commercial space. Formerly known as the Town Hall Gardens, The Queen’s Gardens have been reshaped several times in their history, with the current design opened to the public by Queen Elizabeth II in 1983. Taberner House was built to house Croydon’s Town Hall in 1968 and demolished in 2014 following the council’s decision to redevelop the site. Building work is expected to begin in 2018, subject to planning approval. 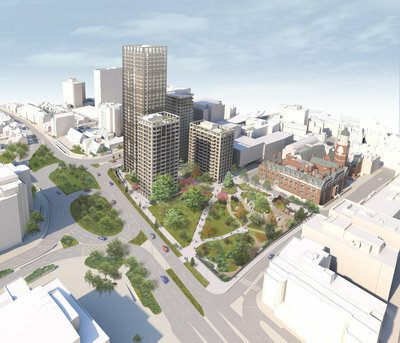 The proposals for Taberner House and The Queen’s Gardens form part of the Mid Croydon Masterplan, a wider project to regenerate this central area of Croydon. A public exhibition of HUB’s plans for Taberner House and The Queen’s Gardens was held in Croydon at Friends Meeting House on 19 January 2017.